I reached Portland two days back, was happy to see that Remy helped us to find a hotel just opposite to the conference center. As I am typing this, I can see the empty roads, and the main doors of the venue. Yesterday also I woke up by 5AM, the virtue of being in a place 12:30 hours apart from your standard timezone :) After writing the article about Microbit support in Fedora (it is still under review) I moved to the conference venue. It was very easy to find the staff room. As usual Doug,Lvh,Eric were already there, later I met Ewa, and then met Betsy for the first time. While discussing security practices when I asked, Lvh pointed out that getting golang vendored sources in the source code repository and then not updating them later, is more of a software engineering problem than a security problem as he sees. Later in the day few of us walked towards downtown to get some lunch, and then we decided to visit Powell’s again. Mike Pirnat gave some valuable insights about children books, and card games :) After coming back to the venue, we saw more people are coming in. Rami was the first person to meet, PyCon is really a great place to meet old friends. Later I met Glyph, Hynek, Guido, Harry, Mike Muller, Graham Dumpleton, and Yarko (I don’t think I will be able to write down people’s names like this from tomorrow, the list will be too long :D ). I also found PyDanny, and Audrey coming in for the registration. It was good see her walking around after the big surgery. 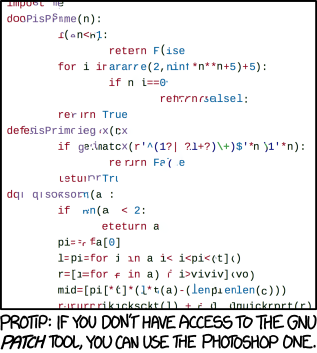 Guido pointed out the xkcd comics about the Python patch. The discussion then moved to regex, legal side of the software field. I also had a chat about how CentOS is helping CPython with CI effort. It turns out that Guido knew about CentOS, but never looked deep into what is that :) He was seems be happy about help CentOS is doing by providing the beefy boxes to do build+test super fast. I am actually going to talk about that today in the Language Summit.